Sin (third left) shows the promotional items with SugarBun personnel and representatives from the sponsoring organisations. KUCHING: Cash prize of RM10,000 awaits the champion of SugarBun Cup competition which will be held here next month. 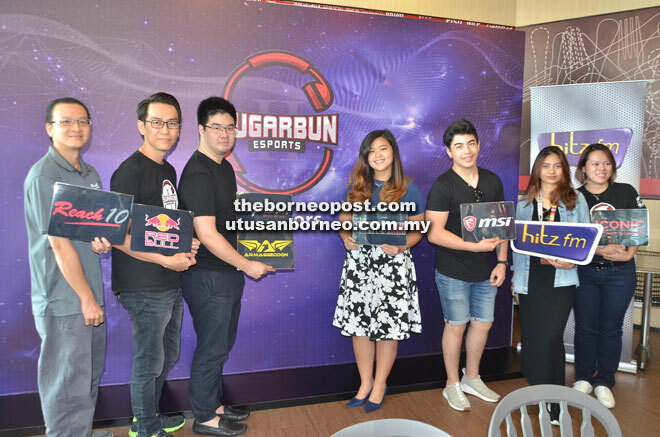 Organised by SugarBun, the gaming event is supported by Hitz FM, Redbull, Armageddon, MSI and Iconic Renovation Company and Borneo Talk magazine. Registration is open and interested members of public can register online at http://www.sugarbun.com/news/events. According to SugarBun Brand Leader Darell Sin, registration opened on Sept 30 and in less than one week half the team slot of 32 (limited to 32 teams) have been taken up. Qualifying rounds will be held on Nov 18 and 19 at Gizmo, OneTJ to select contestants for the main event from Nov 23 to 26 at VivaCity Megamall, C Atrium from 10am to 10pm. The champion team will receive RM10,000, first runner-up RM5,000, second runner-up will take home RM2,000, third runner-up (RM1,000), fourth runner-up (RM500) and the fifth and sixth place will get RM250 each. International casters are invited to cast during the main event from Nov 23 to 26. They are Treephob ‘Xyclopz’ Tiangtrong from Thailand, Sean ‘Hades’ Goh from Singapore and ‘Lilacookie’ from Kuching.